Pagodas and monks are a big part of the tourism experience in Myanmar. The former are ubiquitous, impressive, often beautiful. The latter are fascinating and photogenic. 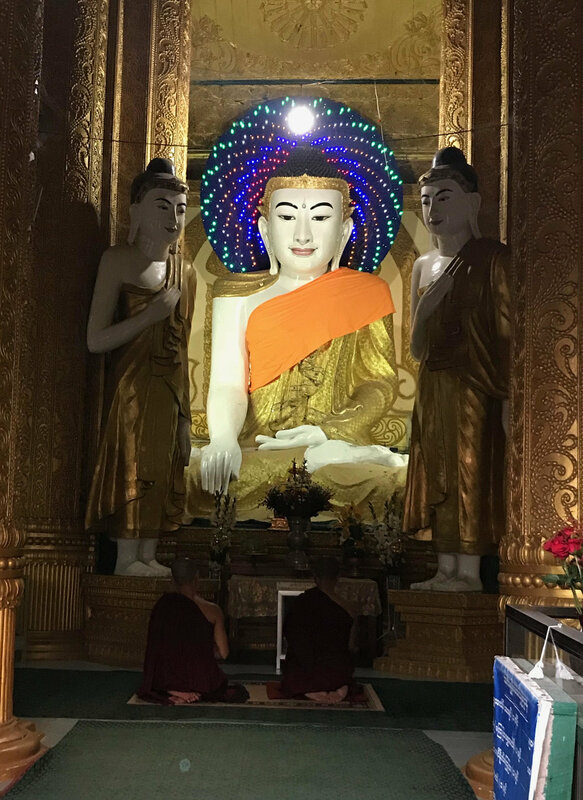 But the longer I stay in Myanmar, the more I question whether the way Buddhism is practised in this country isn't doing at least as much harm as good. As I have said before, Myanmar isn't in a great state economically. Not as bad as it was in the 1970s-1990s, when it spent time in the world's 10 poorest nations ranking. By 2017 it had climbed to number 61 in terms of per capita purchasing power, but for most people, life's pretty tough. Still, you'd never know it was a poor country looking at the pagodas. I can't find out how many there are in Myanmar, but it's not called the "land of pagodas" for nothing. The most pipsqueak village with people living in cane and bamboo houses and working in the rice fields will have at least one pagoda/monastery, sometimes two or three. They are almost all well kept up. And what's most astonishing for an outsider is how many of these have (real) gold all over the stupa. 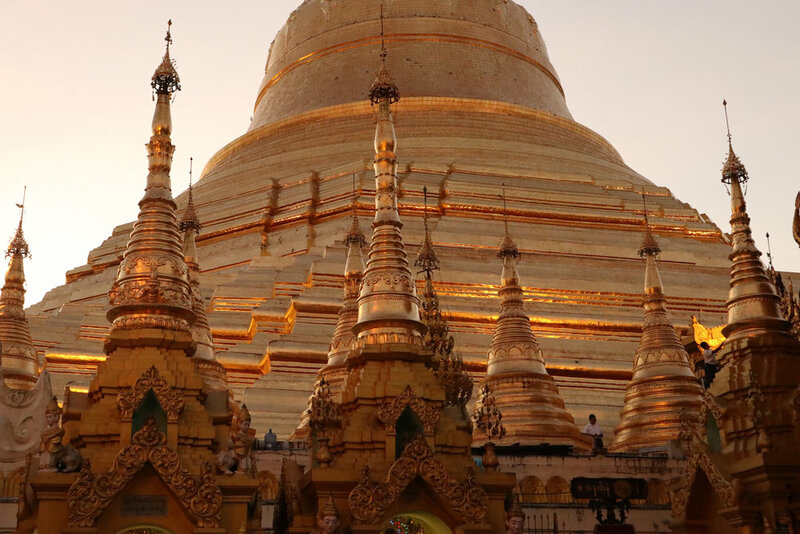 A 2014 article in the Myanmar Times estimated the value of just the frilly "umbrella" bit at the top of the Shwedagon Pagoda in Yangon at $US3 billion, including over half a tonne of gold and 5500 diamonds. That was around 5% of the country's total GDP at the time. The main Shwedagon stupa has more tonnes of gold on it than the official reserve of the national bank. Pagodas are being built and renovated all the time - an impressive, but not terribly productive use of scarce resources. At Ko Yin Lay, a monastery complex in the middle of nowhere outside the small southeastern town of Ye, a vast reclining Buddha has been added to the site since the Lonely Planet guidebook was researched in 2015/2016, and there are signs more building is about to start. Why? Aren't five huge Buddha images enough? Renovating pagodas often involves adding to or replacing the gold on the stupa. In many places you can buy a tiny piece of gold leaf at a price significantly higher than the market price for gold. Then, depending on the height of the stupa, either you stick the gold on yourself, or someone climbs up and puts it on for you. At Inle Lake's Phaung Daw Oo pagoda, so much gold has been layered onto five ancient statues that they look more like legless Teletubbies than Buddhas. It seems crazy to me. The pagodas are beautiful, and necessary in the life of a Buddhist, but surely there do not need to be so many, and they don't need to be the repository for so much wealth. In terms of seriously non-productive use of resources, spending money on gold to pile onto a stupa or statue is way up there. Not even the monks get anything out of it. "How I would like a church that is poor and for the poor," said Pope Francis soon after becoming the head of the Catholic church. In Myanmar, monasteries do provide some social function - they educate many poor and/or rural children. And I'm sure they provide spiritual support for many people. But it's hard not to believe the country would be richer with poorer pagodas. These Mandalay women - four generations, including newborn twins - appeared to be living at the temple. They could have benefitted from a bit of stupa gold. 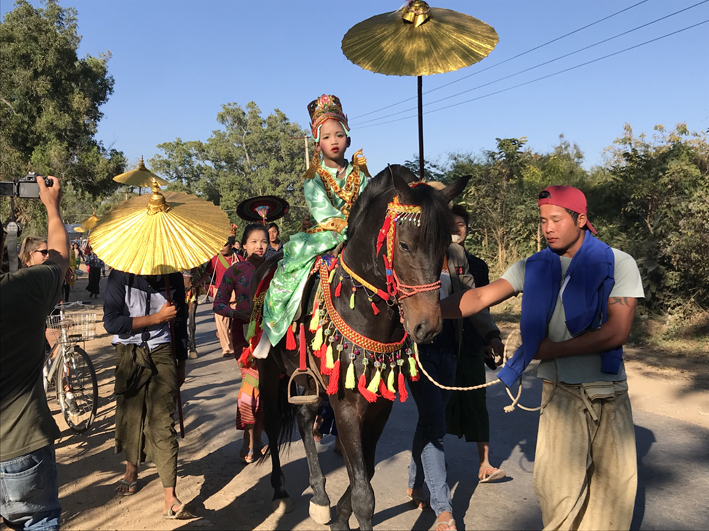 This traditional Buddhist ceremony, carried out before a boy goes to do his stint as a novice monk, can be seriously expensive for families. My Burmese friend Aye Zaw gets really cross. Born a Buddhist, these days he's a Christian living in Auckland and it drives him crazy watching his Myanmar relatives spending what little money they have on gold, flowers, money offerings and other religious paraphernalia for the local temple or monastery. Instead of wasting money in a vain effort to ensure future riches (material or spiritual), he argues, why don't they spend that same money trying to improve their present and future conditions? He doesn't understand his elderly mum getting up at 4am to cook rice and curry for the monks. And he's frustrated by the loss of productivity and drain on the economy having up to half a million men and women of working age shut up in monasteries. But of course I'm not a believer either.